Thank you for your interest in enrolment at St Joseph's School, Moora. We welcome applicants from both Catholic and non-Catholic families, however, those of non-Catholic origin will, as part of the enrolment process, need to agree to support the Catholic ethos and practice of the school. This involves students participating in Religious Education lessons, as well as events such as Masses and Liturgies. To begin the application process, please download and print the document below. Once completed, it should be sent, or delivered, to the school and you will be contacted in due course. If you have any questions, please contact the school on (08) 9690 8888 and we would be happy to assist. 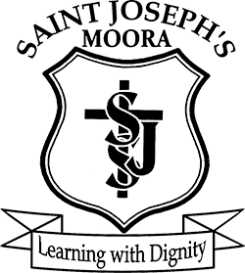 St Joseph's Moora abides by the enrolment policy of the Catholic Education Western Australia. The guidelines are outlined below. Catholic schools exist to further the mission of the Church. In Western Australia, the Mandate of the Bishops requires the Catholic Education Commission of Western Australia to make Catholic school education available to all Catholic children, as far as resources allow. Catholic schools recognise the uniqueness of each student. Catholic schools have a preferential option for the poor and marginalised. Catholic schools fulfil their mission in partnership with parents, who are the first educators of their children. Catholic schools have a responsibility to fulfil the requirements of relevant federal, state and local government laws and regulations. Catholic schools shall accept all application for enrolment forms. The acceptance of an application form does not guarantee an enrolment interview, or offer of enrolment. Enrolment in a Catholic school does not guarantee enrolment in any other Catholic school. Parents need to complete an application form, usually in the year preceding enrolment, however this may vary according to circumstances. Before an offer of a place is made, prospective students and their parents/guardians shall be interviewed by the Principal, or a member of the school leadership team, as appropriate. Enrolment may take place at any year level, Kindergarten to Year 6. If the parent/guardian has knowingly withheld information relevant to the application and enrolment process, then the Principal reserves the right to refuse, or terminate, enrolment on that ground. Parents are required to read the "School Fees and Collection Policy" prior to completing the Application for Enrolment form. Parents are required to complete and sign the Confirmation of Enrolment form prior to the student commencing at the school. This is a contractual agreement between the school and the parents and outlines the obligations of parents in return for the enrolment of their child at the school.